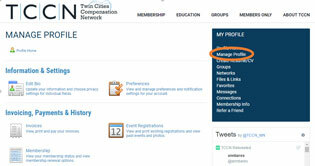 The Minneapolis and St. Paul Twin Cities Compensation Network (TCCN) is a professional membership organization dedicated to providing networking opportunities and educational resources for people in the Compensation profession. TCCN is a Local Network affiliate of WorldatWork . Have a new email address? Remember to update your profile! Sign in, go to Manage Profile, then select Edit Bio. TCCN Awarded WorldatWork "Association of the Year" and "Innovation Star"